Hayao Miyazaki did not attend the Oscars to pick up his Academy Award for Best Animated Film for Spirited Away because he was protesting the Iraq War. When it came time to make his next film, he took his frustration with the war and added a strong anti-war element to Howl’s Moving Castle. Diane Wynne Jones’ original novel, upon which the movie was based, didn’t focus nearly as much on the war but Miyazaki wanted to get his point across. In the end, his film still proved vastly successful, even if it’s not his strongest film. 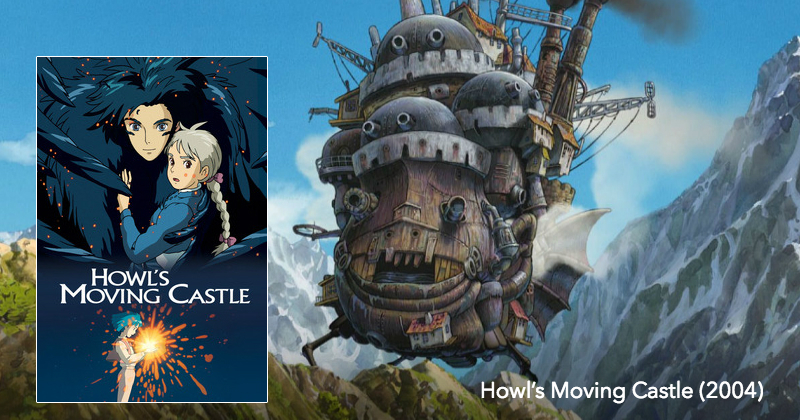 Join us – Pete Wright and Andy Nelson – as we wrap up our latest Hayao Miyazaki series with his 2004 film Howl’s Moving Castle. We talk about the themes Miyazaki is pushing with this film and why, perhaps, his insistence in adding so much war to the film kept him from focusing on other elements of the story that could’ve provided more cohesion. We chat about how we still enjoy this world created here for us, despite some of this lack of cohesion. We discuss the English and Japanese voice actors, pointing out the ones that worked well for us and the ones that didn’t. We touch on some of the French locations Miyazaki used as inspiration to create this world. We revel in the beautiful music that Joe Hisaishi composed for this film, and we marvel at how successful this film was in Japan, even if it wasn’t at the top of our Miyazaki chart. It’s a beautiful film told in an incredibly creative world with a plot that’s a bit messy, but still worth watching. Check it out then tune in! When the movie ends, our conversation begins.